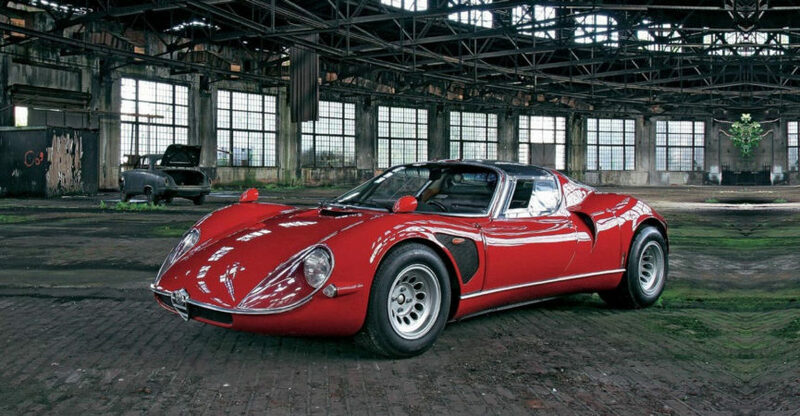 Free Alfa Romeo 33 Stradale Ringtones! Most beautiful car ever made? We think it just might be! Best sounding car ever? To that, we almost certainly say yes. The ultra rare, ultra exotic 1968 Alfa Romeo 33/2 Stradale is an unquestionable showstopper and this past weekend the world was once again reminded of this fact when an utterly pristine example brought traffic to a screeching halt during this years Concorso d’Eleganza Villa d’Este. Taking place annually in Cernobbio, Italy and widely regarded as one of the greatest (if not the greatest) Concours on earth, each year the shores of Lake Como are brought to life with scores of the most valuable, most beautiful iron available anywhere and this years event was no exception. You would assume that the presence of things like a 1962 Ferrari 250 GTO (which there was one), would somewhat lead to a foregone conclusion of victory in the race for the (crowd crowned) Coppa d’Oro Villa d’Este (Golden Cup), but no. The beautiful Alfa, with its diminutive, but mighty 2.0 litre V-8 engine stole the crowds hearts and walked away with the prestigious award. As such for the last few days, the internet has been jam packed with wonderful images and video of the car making it’s way on and around the grounds of the Grand Hotel Villa d’Este and Villa Erba. We were inspired by this and decided we wanted to take a little bit of this with us everywhere we go, so we hit our recording studio. Below you will find links to a couple of ringtones we made for ourselves to enjoy. We thought they turned out so cool that we would share with not only the Alfisti, but any other enthusiast that might enjoy them. We did a full musical tone as well as a short notification sound for things texts and emails. Also included are download and installation instructions, with versions for both iPhone and Android. Simple click the corresponding blue boxes and they are all yours! Import the ringtone to iTunes by double-clicking the ringtone file or by choosing “Add To Library” from the iTune’s File menu. Once your iPhone is connected to iTunes, choose your iPhone and select “Tones” and ensure that the “Sync Tones” and your new ringtone is checked. Once you have synced, you can assign the ringtone on your iPhone by going to “Settings” then “Sounds, then “Ringtone” and choose your new ringtone. Please refer to your phone’s instruction manual for specific ringtone installation instructions. If you like these as much as we liked making them, please don’t hesitate to share them!